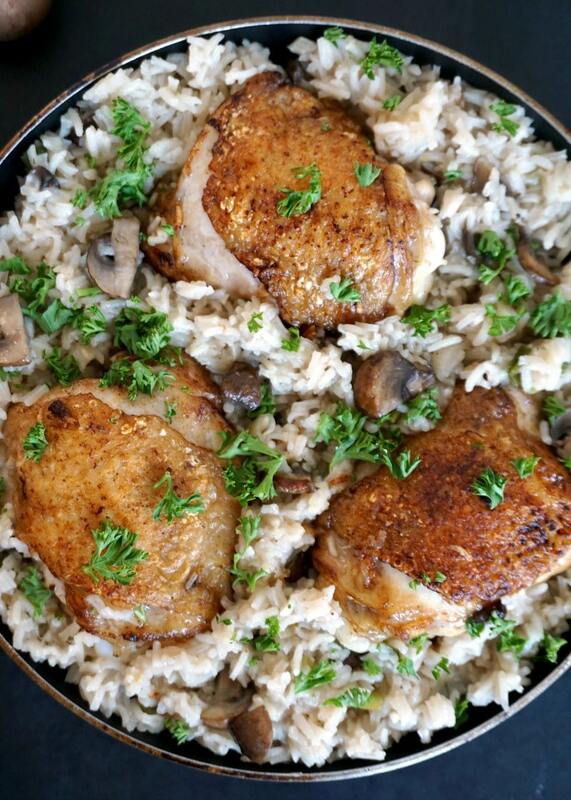 One-pot wonder chicken mushroom rice is an easy meal to feed and please a crowd, and that a very hungry too. No mess, no headaches, just pure comfort food. Now, having said no headaches, l must say that making this chicken mushroom rice proved to be a real adventure. With some headache for sure. But not because of the recipe itself, that’s the easy peasy bit. It just happened to be one of those days when everything went wrong. And it so did! I initially planned to cook the dish in the oven, rather than on the stove, but it was not meant to be, clearly. Luckily in the end it tasted better than expected, and everybody enjoyed it. But what a drama, hey! So, l tucked my older daughter in bed for her nap, and thought l would take advantage and cook her lunch. Got her baby sister in her bouncer, and started preparing the ingredients to cook the meal. Cheeky little monkey, who so far was all nice and happy, decided she had enough of behaving herself and started crying.Right, mission aborted, no more cooking, baby needed kisses and cuddles, so mummy obliged. Ok, baby wanted a nap too, and in mummy’s arms only. Nothing wrong with that! By the time l got her all nice and happy again, sweetness number 1 woke up, on the wrong side of the bed too, l must add. Got the girls happy, and since hubby was home, he came to the rescue to entertain little ones while mummy went back to the kitchen. But surprise, the oven stopped working. Oh well, baking was no longer an option. Right, nevermind! I got to pan fry the chicken first, then the alarm went off because of a tiny bit of smoke. By now, l could feel my husband’s eyes burning me because l was stinking up the house with my frying (he’s not quite a meat fan all the time, you see!). Anyway, food cooked, l even got to quickly take some photos, lunch was yummy, all forgotten. Phew, that was not easy! Although l guess it was worth all the drama, this dish really tastes great. It’s filling, it’s packed with great flavours, and most importantly, it’s all in pot. Texture wise, it’s more like a risotto, in the sense that the rice is sticky, rather than the grains separated, but it’s so good. It did remind me of my Chicken and peas risotto, although it is not the same creamy texture. Well, it’s not meant to be creamy anyway. 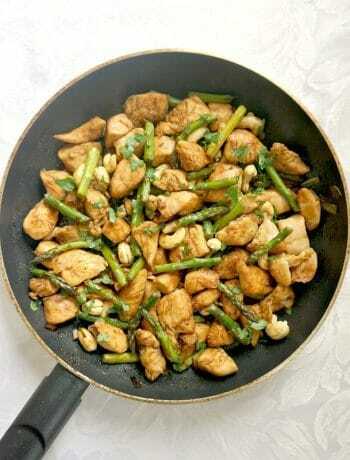 The mushrooms add so much flavour, especially since they have been cooked together with the garlic and spring onions. No much seasoning is needed, since the chicken stock (broth) is pretty salty anyway. The finishing touch, parsley, is not be to skipped, its aroma brings freshness and a certain kick to it. Who said home-cooking isn’t fun? 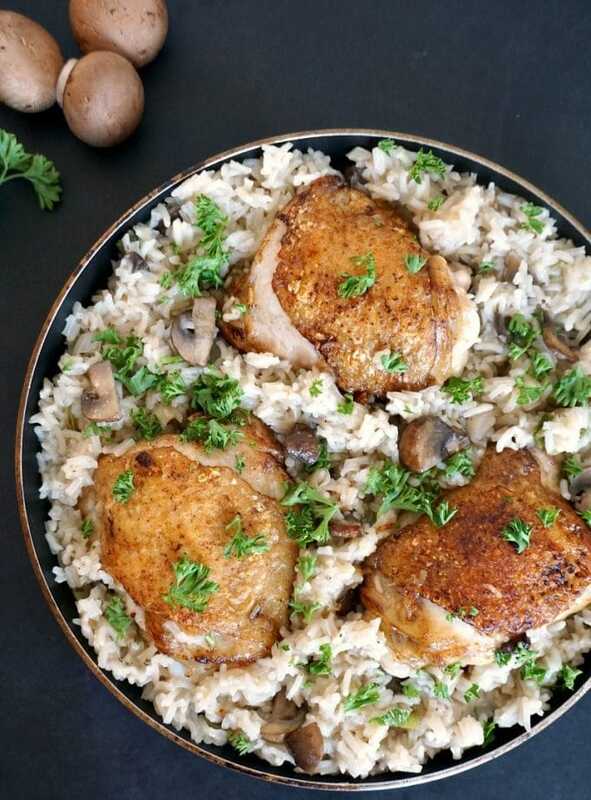 If you’ve tried my ONE-PAN CHICKEN MUSHROOM RICE or any other recipe on the blog then don’t forget to rate the recipe and let me know how you got on in the comments below, I love hearing from you! You can also FOLLOW ME on FACEBOOK, and PINTEREST to see more delicious food and what I’m getting up to. 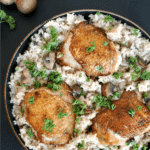 One-pot wonder chicken mushroom rice, a healthy and delicious dish, the kind of easy chicken one-pot recipes that never fail to impress. A great family favourite meal. In a large frying pan, add the oil and place the chicken thighs skin down. Fry for 5 minutes until lightly brown, flip on the other side and fry for a further 5 minutes. The chicken will not be fuly cooked at this stage, but will cook further later on. In the same pan, add the sliced mushrooms, garlic and onions, season with salt and pepper and cook gently for a few minutes until soft and until all the liquid is evaporated. Rinse the rice under cold water until the water runs clear, and add it to the pan together with the stock. Give a good stir, bring back the chicken to the pan, cover with a lid, and leave to cook undisturbed for 20 minutes or until the liquid has been absorbed, the rice is cooked and the chicken is tender. I pinned this for later for suure. Looks so delicious. I love one pot wonders!! I definitely understand those days where everything seems to go wrong. This dish looks like it turned out great in the end despite everything that happened. Love one pot meals. Such a time saver. For a working mom like me it’s almost a blessing. Saving for later. It does save time and your sanity to get easy meals ready. Glad you liked it! What a beautiful, hearty meal! 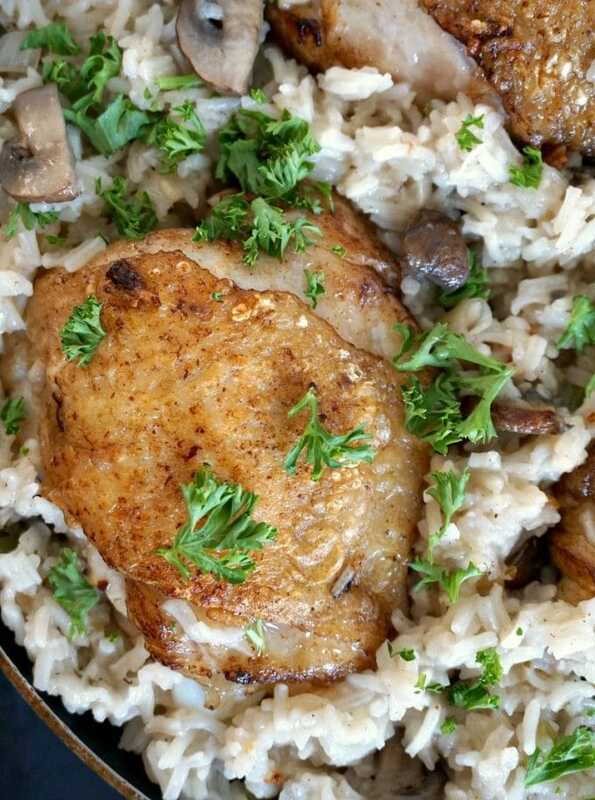 You can’t beat chicken and rice…looks splendid! Your story about nap time made me laugh! How you have time for the little ones and a beautiful blog is inspiring! I love mushrooms and I love one pot dishes. Can’t wait to make this! It’s a very easy one, l’m sure he’ll like it! That was quite the adventure! I have had my oven go out mid bake, and it’s so frustrating isn’t it? Looks like you meant to make this on the stove top!! Nice save! It certainly is frustrating! I hope to get it fixed soon, l so need it! Thank you, l’m sure they all will love it! i just made a rice/mushroom dish the other day and my husband loved it. 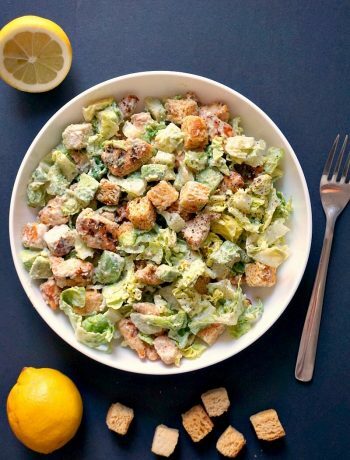 I’m going to add your recipe to this week’s menu … should be an all around win! Thank you! 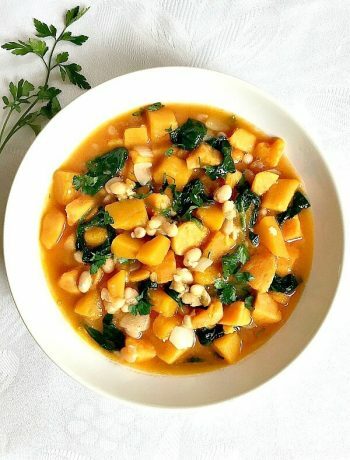 It’s a great dish, and so simple. Are you getting a new oven? The dish looks delicious so cooking it on top of the stove seems to have worked. Now you are a person who can think on her feet. You went from plan A to plan B to plan C and I lost count after that. The recipe looks wonderful and I so enjoy one pan meals. Your dinner turned out scrumptious!! Aww thank you very much for your lovely comment. Being a mum can be challenging, that’s for sure!